Better Chemistry and Service at Work for You! NOBLE Technologies, Inc. manufactures a line of formula-rich coagulant replacement products and complementary flocculants to meet a range of industrial needs. Because ours is a simple process, our products are easy to use. You'll find less disruption of the manufacturing process, and no need for system upgrades to switch. Plus, our ingredient-rich formulas are more consistent to keep your operation running smoothly day after day. Noble 1 is extremely reactive and should be diluted at least 10:1 with clean water prior to application. Metering with a corrosion resistant, positive displacement pump to a highly agitated area of the process stream ensures adequate distribution and mixing and produces best results. Noble 1 is not expected to be toxic by ingestion or by skin contact. This product can cause dryness to the skin by astringent action. Eye irritation can occur due to its astringent action. Refer to Noble 1's Safety Data Sheet to obtain more information. Storage in glass, stainless steel, plastic or epoxy-lined vessels is recommended. Do not use copper, aluminum or iron in feed or storage systems. Spills can be readily flushed with copious amounts of water. If Noble 1 freezes during shipment or storage, it may be thawed and used after agitation to ensure homogeneity. Noble 1 is shipped in concentrated form. If evaporation should occur and the product becomes solid and glass-like, it may be redissolved to restore full activity. Noble 1 is shipped in : 55 gallon, 525 lb. NET, non-returnable drums, and 275 gallon, 2625 lb. NET ToteBins. Shipment is FOB our plant in Perkasie, PA. For more information, contact your Noble representative. Noble 1 coagulant replacement is manufactured from materials approved for use by the United States Environmental Protection Agency as "coagulant aids" in the treatment of potable water at a maximum concentration of 40mg/1 applied dosage. Noble 1 has not been reviewed as a manufactured product itself by the US EPA and does not appear on any approved lists published by the US EPA. Noble 60 is intended for use as an aid in forming large, settleable flocculant formed by the use of polymeric or metallic coagulants. Typical usages are in the processes of removing metals in precipitation, gravity settling, non-potable water clarification, mechanical de-watering and other such processes. Usage at pH' from 9.0 - 11.0 are representative, although use outside this range has been found to be effective at times. Bulk Density 48-55 lb/cu. ft.
Noble 60 should be aspirated into water using an eductor to make a 0.1-0.2% solution. Homogeneity should occur within 30 minutes and is faster in warm water. Noble 60 is non-toxic by ingestion or by absorption through the skin. Noble 60 is non-irritating to the eyes and skinbased on tests using laboratory animals. Before using this product, refer to Noble 60's Safety Data Sheet for further information. Noble 60 has minimum environmental impact. A one-percent solution will contribute approximately 100mg/L of BOD5 and 9000mg/L of COD to a system. Spilled polymer is very slippery and should be scooped up, wiped up or absorbed on inert material before flushing thoroughly with water or steam. Bleach is also helpful in breaking down the polymer and removing it from surfaces. Store in plastic, epoxy-lined, stainless steel or glass-lined vessels. Material must be kept dry until ready for use. Noble 60 is shipped in 50 lb. bags, FOB Perkasie, PA. For more information, contact your Noble representative. Scroll to read or click for pdf versions of Noble 1 SDS or Noble 60 SDS. USA OSHA inhalation hazard. Contains water soluble aluminum compounds. Exposure limit is 2MG/M3 as Al for soluble aluminum salts. Product is an eye irritant. General Information: Eyewash station should be available if there is risk of eye contact. Inhalation: Inhalation can cause dryness and distress. If inhaled as a mist, remove to fresh air. Obtain medical attention for distress. Skin: Single, short exposure causes no known adverse effect. Repeated exposure may cause irritation. Flush skin with clean water, wash with soap and water. Eye: Contact with eye may cause redness and swelling due to the astringent properties of the product. Flush immediately with clean water for 15 minutes. Oral: Swallowing large amounts may cause gastrointestinal discomfort. Small amounts transferred during use should not cause injury. Obtain medical attention if large amounts are swallowed or there is discomfort. Suitable extinguishing: Product is not flammable. 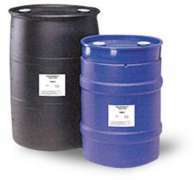 Containers may be sprayed with water or water-based agents. For safety reasons unsuitable extinguishing agents: None known. Special hazards: On heating, product may form acid-chloride gases. Protective equipment: Full protective gear and self-contained breathing apparatus (SCBA) for industrial fires. Person-related safety precautions: Mist in air is an inhalation hazard and an eye contact hazard. Product can also irritate the skin on long exposure or according to a person's individual sensitivity. Measures for cleaning/collection: Product could be recovered using absorbent material. Product is water-soluble but will form a solid/gel on drying. Product reacts with soaps forming a hydroxide gel. Clean area with clear water. Information for safe handling: Avoid creating mist that will be a health and exposure hazard. Information about protection against explosion and fires: Product is not flammable or explosive. Requirements to be met by storerooms and containers: 10 to 49C. Information about storage in one common storage facility: No restrictions. Storage class: Information not available. Class according to regulation on inflammable liquids: No restrictions. Components with critical values that require monitoring at the workplace: If mist in air is above TLV, proper respiratory protection should be provided. General protective and hygienic measures: Avoid exposure to mist in the air, contact with eyes or excessive skin contact. Breathing equipment: Mist mask if TLV is exceeded. Protection of hands: Impervious gloves if contact is excessive. Eye protection: Safety glasses at a minimum, goggles for risk of exposure. Body protection: Work uniforms should be adequate. Form, color and smell: Liquid, clear and colorless to amber, with a slight, astringent odor. Flash point: None, product is not flammable. Ignition temperature: None, product is not flammable. Decomposition temperature: Decomposition will begin at temperatures in excess of 100C. Self-inflammability: None, product is not flammable. Danger of explosion: None, product or mist from product will not support combustion. Non-polar solvents: Soluble in alcohols and glycols. pH value: Approximately 4 in a 30g/100 aqueous solution. Thermal decomposition/conditions to be avoided: Heat in excessive of 90C for long periods of time. Materials to be avoided: Caustics will form Aluminum Hydroxides. Dangerous products of decomposition: Acid Chloride, as HCl can form if product decomposes. Acute toxicity: Product is an acute irritant to eyes or, as a mist, to the respiratory system. Specific symptoms in biological assay: Information not known. On the skin: Can cause irritation on prolonged exposure. On the eye: Immediately causes irritation, redness and swelling. Sensitization: Persons can be or become sensitized to this product. Subacute to chronic toxicity: Mist can damage the respiratory system on long-term exposure. Information about elimination (persistence and degradability): Information not known. Behavior in environmental systems: Information not known. Components: Water soluble aluminum compound and water. Mobility and bioaccumulation potential: Information not known. Other information: Product is water miscible. Ecotoxical effects: Information not known. Aquatic toxicity: Information not known. Type of test/Effective concentration method assessment: Product can be determined by % Al to ppm range. Additional ecological information: Information not available. According to raw materials/assay, contains the following heavy metals and compounds: May contain no more than 5 ppm total heavy metals. Waste disposal key numbers: Information not known. Uncleaned packagings: Information not known. Recommended cleaning agent: Remove as dry material or wash with clear water. Kemler Number: Information not known. Designation of goods: Information not known. Remarks: This is not a hazardous material for transportation as defined by USA Dept. of Transportation. IMDG/GGVSea Class: Information not known. EMS Number: Information not known. Marine pollutant: Information not known. Code letter and hazard designation of product: Information not known. Risk phrases: Exposure limit TLV: 2 Mg/M3 as Al. Safety phrases: Avoid eye contact and inhalation of dust. Special designation of certain preparations: Information not known. Information about limitation of use: Maximum percent in a formulation may be limited. Decree to be applied in case of technical fault: Information not known. Classification according to VbF: Information not known. Technical instructions (air): Information not known. Class Share in (%): Information not known. Water hazard class: Information not known. Other regulations, limitations and prohibitive regulations: Information not known. SDS updated May 2015 by Noble Technologies, Inc. This information is offered in good faith as typical values and not as a product specification. No warranty, either expressed or implied is hereby made. The recommended industrial hygiene and safe handling procedures are believed to be generally applicable. However, each user should review these recommendations in the specific context of the intended use and determine whether they are appropriate. Eye Contact May cause mild eye irritation. Symptoms include stinging, tearing and redness. Ingestion Swallowing small amounts of this material during normal handling is not likely to cause harmful effects. Swallowing large amounts may be harmful. Inhalation This material is a dust or may produce dust. Breathing small amounts of this material during normal handling is not likely to cause harmful effects. Breathing large amounts may be harmful. Symptoms are not expected at air concentrations below recommended exposure limits, if applicable (see section #8). Symptoms Signs and symptoms of exposure to this material through breathing, swallowing, and or passage of the material through the skin may include; stomach or intestinal upset, irritation, headache, dizziness. Carcinogenicity This material is not listed as a carcinogen by the IARC, NTP or OSHA. Reproductive Hazard No data, Based on available information, the risk to the fetus from maternal exposure to this material cannot be assessed. Inhalation: Remove to fresh air. Obtain medical attention for distress. Eye: Contact with eye may cause irritation. Flush immediately with clean water for 15 minutes. If symptoms persist obtain immediate medical attention. Oral: Seek medical attention. If the individual is drowsy or unconscious do not give anything by mouth; place individual on left side with head down. Contact physician, medical facility or poison control center for advice about inducing vomiting. If possible, do not leave individual unattended. Special hazards: On heating, product may form ammonia, carbon dioxide and carbon monoxide, nitrogen oxides, acid vapors, nitrogen compounds acid vapors. Person-related safety precautions: For personal protection see section #8. Persons not wearing protective equipment should be excluded from the area of spill. Material can create slippery conditions. Avoid breathing dust. Measures for cleaning/collection: Sweep or vacuum spillage and collect in suitable container for disposal. Flush area thoroughly with water and scrubbed to remove residue. If slipperiness remains apply dry sweeping compound. Information for safe handling: Avoid creating and breathing dust. Do not allow dust to accumulate on structures or equipment. This material is slippery when wet. Store in a cool dry ventilated area. Maximum storage temperature: Information not available. Provide appropriate exhaust ventilation at places where dust is formed. Provide sufficient ventilation to maintain exposure below exposure guidelines, or below levels that cause known, suspected or apparent adverse effects. General protective and hygienic measures: Avoid exposure to dust in the air or contact with eyes. Eye protection: Safety glasses or chemical splash goggles when dust is possible. Protection of hands: Wear resistant gloves or impervious gloves if contact is excessive. Breathing equipment: A NIOSH approved air purifying respirator with an appropriate cartridge and/or filter may be permissible under certain circumstances where airborne concentrations are expected or exceed exposure limits, or if overexposure has otherwise been determined. Protection provided by air purifying respirators is limited. Use a positive pressure, air supplied respirator if there is potential for uncontrolled release, exposure levels are not known or any other circumstances where an air purifying respirator may not provide adequate protection. Form, color and smell: Powder, white, with a slight, characteristic odor. pH value: Approximately 7.3 in a 5g/1L aqueous solution. Dangerous products of decomposition: On heating, product may form ammonia, carbon dioxide and carbon monoxide, nitrogen oxides, acid vapors, nitrogen compounds acid vapors. Acute inhalation toxicity: Information not known. Acute dermal toxicity: Information not known. On the eye: Mildly irritating to the eyes. Test conducted using environmentally representative water. ICAO/IATA Class: Information not known. Proposition 65 warnings are not required for this product based on the results of risk assessment. This material does not contain any chemical components with known CAS numbers that exceed the threshold reporting levels established by SARA Title III, Section 313.